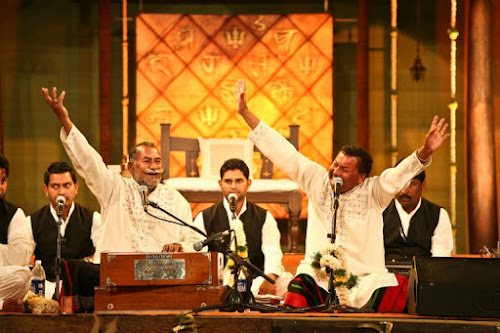 Yesterday's "Sa Re Ga Ma Pa" (the only show I have watched on TV since 2007) was a Qawali special with the "Wadali Brothers" as 'Guests of Honor' for the day. The show ended with a live performance by the two brothers, on their song "Tu Maane Ya Na Maane". Watching them sing on stage was a phenomenal experience! Actually, music always has a strange effect on me (and everyone else too, I'm sure)... sometimes soothing, sometimes inspiring, and sometimes recharging the tired soul! I remember, my sister and I always did our Math homework with some music playing in the background. Even walking becomes so much more fun when I have some steady beats playing on my cell phone. In fact, the food seems to taste better too, on days when I play some music (usually Ricky Martin or Elvis Presley) while cooking, and sing along with it! But watching the Wadali Brothers' performance yesterday... it was something totally different! Those guys seem to have a perpetual smile pasted on their faces as they sing! As if it's some kind of special treat for them... that they've been given the opportunity to sing! Honestly! The way they were singing... it seemed as if they truly believed that they were performing live in front of God! And their overflowing joy was so infectious... my Dad and I were simply mesmerized! Dad said it seemed as if a waterfall of music had suddenly started flowing! And I could actually visualize all the devi-devtaas gathered up in the skies... looking down from the heavens above... each one with a "Colgate grin" sparkling on his/her face... relishing every moment of their performance! You can see the original video of this song above, but it's not even remotely close to watching the brothers perform live! Their stage performance yesterday seemed to transport you to a completely different era... where time seemed to stand still! Oh... but time is always still isn't it? Like a stationary point... one point for '29th August 2009 - 10:34:45 pm'... another point for '29th August 2009 - 10:34:46 pm'... and so on! And it's us who keep moving from one point in time to another! Or *our minds* rather... that keep hopping back-and-forth between the past, present and future! Their performance yesterday seemed to transport you to a place where YOU stood still! No past... no future... only that particular point in time! And their performance in that point of time! Their 'celebration of life'... which made YOU feel like celebrating too! Celebrating the fact that you could be witness to such a performance... that you could watch them, listen to them, and even smile with them! So much so, that you began to share the same kind of insane joy with them! Yes i agree..i saw it too..they sang soul stirring number, n i somehow found myself appreciating lyrics the most ..about khuda n banda..it was awesome...! Hmmm yeah... they said they compose all their songs themselves. I kinda like that particular genre of music btw... fills you with faith and hope! Do you download stuff through torrents? If yes, then I can send you the torrent for that episode... the other performances were also good... being a Qawali special episode. and ur power scene?? whats on that front?? The transformer was finally changed yesterday afternoon. So we have power now! Are you on Facebook? Hmmm yeah! Sufi music sure has some strange quality... makes you feel more connected to God in some way. Yaar... what is your email id? Can't find it anywhere on your blog! Send me an email on the ID given in my blogger profile. Yupp! I don't know about YouTubes, but it's there on Zee TVs website... although it's not the complete performance. If you use torrents for downloading stuff, let me know your email ID... I have downloaded the entire show and I'll be able to send u the torrent link for it. I know! It's enigmatic, isn't it? Thanks for your kind words AS! :) Glad u liked it!